It’s not too late for orthodontic treatment. People choose to get their teeth straightened for a number of reasons and at various stages of life. 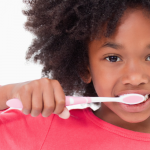 The primary purpose of straightening teeth is prevention. 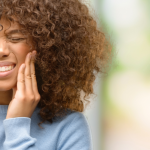 Crooked teeth can have a negative impact on your oral health over time, contributing to cavities, periodontitis, jaw pain, headaches, and chewing problems. Many times, patients are mistaken that braces are primarily for kids and teenagers. Perhaps that used to be the case, but according to the American Association of Orthodontists, one in five patients seeking orthodontic treatment is an adult! Invisalign is one of the most popular options among our adult patients. Invisalign clear aligners are custom-made for your teeth, draw zero attention to your treatment, and allow you to focus on what’s most important in life! Best of all, Invisalign only lasts an average of 18 months, about half the time it takes with traditional braces. Every few weeks, you receive a new set of aligners that gradually move your teeth to the desired position. 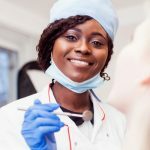 In this sense, the Invisalign approach to orthodontics isn’t all that different from traditional braces, which require monthly adjustments at the dentist’s office. Traditional braces bring different advantages to the table. Before we make any comparisons, it is important to note that there are now braces available in styles appropriate for adults. 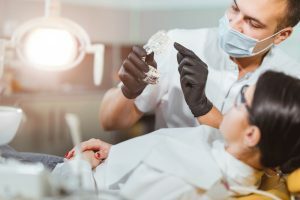 Orthodontic technology has advanced significantly even in the past thirty years, so what you may imagine about traditional braces is likely to be quite different from the reality. PDM offers subtle traditional brace designs that work well for our adult patients. People choose traditional braces over Invisalign for a variety of reasons. Some people find that they are more comfortable than Invisalign aligners. Others don’t like the requirement of removing aligners during meals because they feel they don’t have enough time to eat (aligners must stay in for at least 22 hours each day). By comparison, with traditional braces you can take as long as you like to eat or sip a cup of coffee, within the limits of required food restrictions. Braces also require a greater time investment for cleaning teeth after meals. The presence of the appliance can trap food in your teeth, increasing your likelihood of cavities if you don’t keep up your oral hygiene. Invisalign treatment also requires teeth cleaning after meals, but with the aligners outside the mouth, this tends to be a quicker process. 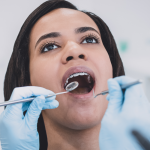 Finally, some adults choose traditional braces because the overall cost tends to be lower than that of Invisalign, though this is not the case at Penn Dental Medicine. Both braces and Invisalign are equivalent in cost for our patients, allowing them to choose the right option for their health and lifestyle. Straighten Your Teeth at PDM! Patients love Penn Dental Medicine because we offer high quality orthodontic care at reduced prices. Because we provide care at Penn’s dental school, all patients are seen by orthodontists who are in their final stage of schooling, overseen by our experienced faculty members. We offer orthodontics for both adults, teens, and children. If you’ve considered getting your teeth straightened and haven’t made a decision yet, we encourage you to schedule an informational appointment. You will be evaluated by an orthodontist and advised on your options for treatment. Don’t forget to present this $25 off coupon for your first visit when you arrive! Our office can also be reached by calling 215-898-8965.